RDP has partnered with TravelClick to offer RDP customers a tremendous number of reservation channels. 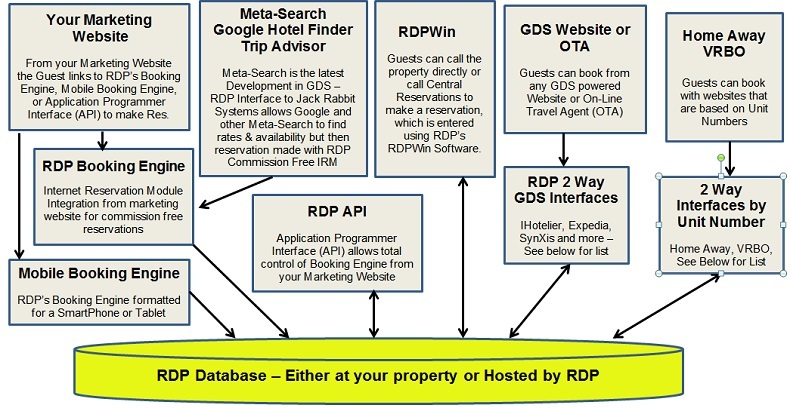 RDP has a two way interface with TravelClick's iHotelier CRS to send rates and availability to the Global Distribution System (GDS) and load reservations from the GDS into the RDP system. TravelClick recently purchased EZYield to add over 600 additional reservation channels not available on the GDS. The RDP iHotelier 2-way Interface sends rates/availability from the RDP system to iHotelier. iHotelier sends it to the traditional GDS, such travel agents and many Online Travel Agents (OTA). iHotelier sends rates and availability to EZYield, which forwards this information on to over 600 non-GDS channels. For a complete list, go to: http://www.ezyield.com/fuzionlink/ and click “full list” on the right side of the page. Reservations from all channels automatically loaded into the RDP System. Why Use the iHotelier / TravelClick Interface? Increase revenue by having true 'last room availability' open to the iHotelier / Travel Click / EZYield distribution channels. Or manage an iHotelier room block within the RDP Software. Reduce manual data entry by having reservations loaded automatically into RDP via the iHotelier system. Manage GDS cut-offs from within RDP to close out busy dates or holiday periods on the GDS. Sign a contract with iHotelier for their GDS services. iHotelier charges a set up fee, monthly fee, and a per reservation fee for their services. Please contact iHotelier to learn more about pricing. Update to the latest version of RDPWin 2.x or 3.x. The interface uses RDPWin Monitor to communicate and does not have any special hardware requirements. However, the property must have high speed internet access, but the only machine that needs this access is the machine running the RDPWin Monitor. The only other requirement for all two-way interfaces is the property must not be using RDP-DOS or the IRM Classic for reservations. Purchase the iHotelier interface from RDP: $6,000 plus an additional 15% annual increase in support. Contact your iHotelier Account Manager to begin the process of interfacing with RDP. Detailed information on GDS Integration	here. For more information contact RDP.